That’s 975 #calories per half. Frozen pizzas can be deceiving. Have you seen some of those end zone dances? This is serious business. Plus, I’m counting on your doing each dance for 15 to 20 seconds. Fit Tip: There are frozen and delivery pizza choices with a lot fewer calories. If you choose thin crust and avoid meats and extra cheese you can drop the calories down to about 720 for half a 12-inch pizza. That’s a lot of face painting! Creamy mac and cheese has more than 850 calories in just 1 cup. It’s made with lots of high-calorie Cheddar cheese (or processed cheese), Parmesan cheese, butter, pasta, milk and sometimes sour cream. Fit Tip: This dish is really easy to make over. How about using low-calorie cheese, whole-grain pasta, skim milk and cooking spray instead of butter? Each potato skin (half a potato) is 218 calories. That’s a lot when you consider that an entire potato is 160 calories. 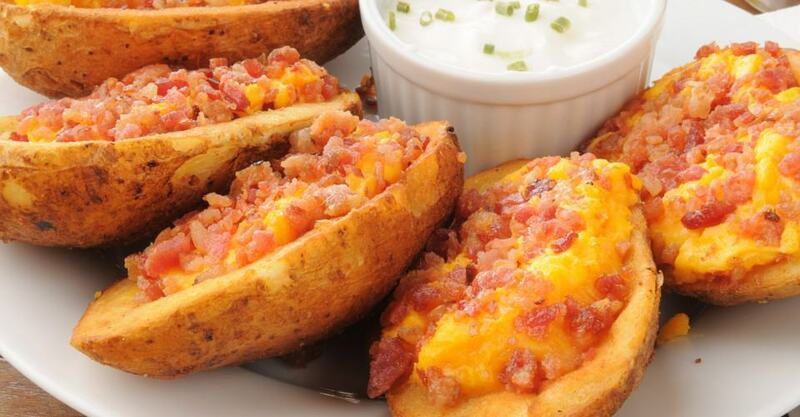 But these potato skins are deep fried and topped with cheese, bacon and even sour cream. Fit Tip: These are so easy to make yourself. Microwave the potato, then cut it in half and put it in the toaster oven with some cooking spray. Fit Tip: Skip the sour cream, and if you make them yourself, bake them instead of frying. It has meatballs, mozzarella cheese and marinara sauce on a hero roll, adding up to 1,020 calories. Fit Tip: How about turkey meatballs (made with breast meat), low-fat mozzarella and a whole-grain hero? You won’t even taste the difference. Keep in mind, this is 59 minutes of actual playing time — standing on the sidelines or in the huddle doesn’t count. Each wing has 90 calories, and the dipping sauce is about 50 calories per container. Fit Tip: You can certainly make your own chicken wings. Go skinless and bake instead of deep frying them. That’s almost 5 1/2 hours of cleaning — no breaks. And yes, that pint has 1,320 calories. Fit Tip: There are so many very tasty low-calorie ice creams. For instance, Breyers All-Natural Vanilla, Chocolate, and Strawberry is 110 calories per 1/2 cup or 440 calories for a pint, so you save nearly 900 calories. In case you don’t know, a slider is a small hamburger — and people eat many of them. They’re about140 calories each and weigh just a bit more than 2 ounces each. 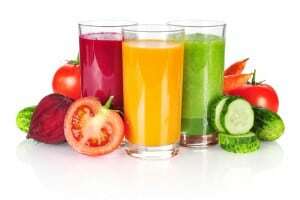 Fit Tip: Could you eat just one or two? The combination of beer and nuts is a football natural, but it’s costly — especially if you keep taking handfuls and gulps. Just one handful and a couple of gulps mean loads of push-ups, sit-ups, jumping jacks, sprints and more. Just so you know, 1 ounce of mixed nuts has about 170 calories. And the beer — about 35 calories per gulp. Fit Tip: Nuts are healthy if you eat them in small portions — maybe seven to 10. More than that is a mistake. As for the beer, there’s Beck’s Premier Light, Budweiser Select 55, MGD 64 and several others — do a taste test. Just one chip requires some serious rocking out. Two tablespoons of the bean dip is about 30 calories, and the chip itself is about 14 calories. Fit Tip: The answer is salsa — it’s very low in calories. And pick baked, low-calorie chips at about 120 calories per ounce. If you’re eating the chips, have one at a time, and don’t put out huge bowls of them. Make sure you have to get up each time you want more than six chips. Although this sandwich is grilled, the high-fat pastrami, Swiss cheese, thousand island dressing, and butter or margarine on rye bread mean that the whole thing can top out at more than 900 calories. Fit Tip: What about a turkey breast sandwich with ketchup and low-fat cheese on whole wheat? Put it in a pan with cooking spray and grill it. It’s not just about wearing a silly suit; it’s hard work running around, getting the crowd going. As a point of reference, each restaurant-style chip has about 14 calories. Now add cheese, beans, ground beef and peppers. Just six nachos will cost you about 569 calories ­ not to mention the sour cream and guacamole for another 150 to 300 calories. A single tablespoon of guacamole (which can be healthy) — probably the amount you use on each chip — adds 20 calories. Sour cream has about 30 calories per tablespoon. Fit Tip: You can always make the nachos with low-fat cheese and black beans. Use salsa and make your own whole-wheat pita chips and you’ll be even better off. Yes, that’s right, a simple Ritz cracker has 16 calories, and just a tablespoon of Kraft Cheez Whiz contains 45 calories, for a grand total of 61 calories in a single bite. Fit Tip: Avoid the cracker altogether and cut up small squares of low-fat cheese — you really won’t notice the difference. In fact, you would probably eat cardboard if someone put it in front of you during the game. It’s about 18 miles from South Beach to Dolphin Stadium, which is what it would take to burn off the chips and dip. Each chip is 14-15 calories. For each scoop of Ruffles French Onion Dip add another 55 to 60 calories. Grand total: as many as 600 calories. Fit Tip: Try a low-calorie dip or make your own with nonfat yogurt or mayo. And use Popchips.